Everyone knows that renewable energy in the form of solar and wind has big problems when it comes to providing reliable electricity generation. Photo-Voltaic (PV), the solar technology being installed at a frantic pace all over the world supported by Feed-In-Tariffs is notoriously variable. Wind is even worse, even when averaged over a large geographic area. For example, Texas set a new wind energy generation record for the state on Christmas day, 2012 – 8.63 GW for a few hours. The very next day, between noon and 6:00 pm all the wind farms in Texas combined produced less than 0.3 GW. But there is a source of renewable energy that can be relied upon to produce electricity 24 hours a day, 365 days a year. That is Concentrated Solar Power (CSP) supplemented by molten salt Thermal Energy Storage (TES). In the summer time there is enough solar power to maximize the TES so that the plant can run at full capacity 24 hours a day. 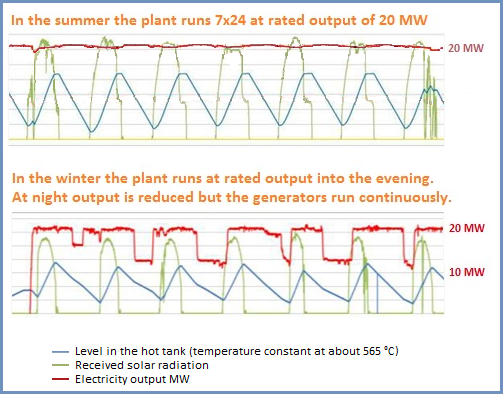 In the winter the plant can still run at capacity during peak demand times but output is cut back for a few hours at night. Plants similar to Gemasolar are under construction in the United States today, the largest being the Ivanpah plant in California's Mohave desert. Is the technology expensive? Yes, significantly more than the cost of PV. But considering that peak demand for electricity occurs just as PV is fading in the late afternoon and evening the cost of CSP is easily justified. In a previous blog I discussed three very different types of solar energy electricity generation; Photo-voltaic (PV), Concentrated Solar Power (CSP) and Solar Updraft chimneys. This blog will deal with a branch of CSP that hasn’t received much attention and hasn’t yet been commercially deployed on a large scale. This could be referred to as Non-Thermal CSP. CSP involves using lenses or mirrors to concentrate solar energy in order to generate high temperatures. A simple demonstration of CSP would be the use of a magnifying class to singe a piece of paper on a bright summer day (to this day hours of sunlight are often still measured in exactly this way using a Campbell-Stokes recorder). The most common reason for using CSP for electricity generation is to heat a fluid to a temperature much higher than 100 degrees Celsius. This fluid is then circulated through a water reservoir using a heat exchange system in order to generate steam to drive a turbine. More then 1GW of capacity is installed worldwide using this type of CSP plant, predominantly in Spain and the United States. There are significant advantages that come with this configuration, particularly when it includes molten salt Thermal Energy Storage (TES) as most of the newer plants do. The steam boilers and generator act to filter out any short term variability in received radiation that is caused by passing clouds. The TES can allow the facility to generate electricity through the afternoon and evening, which allows the supply to match demand. Finally, by providing a secondary non-renewable source such as natural gas to heat the boilers these plants can act as “dual-fuel” generators able to produce electricity around the clock. This capability has been implemented at the SEGS facility in California. It is worth noting that although the SEGS facility has provided reliable power for more than 20 years it had a rough start. The developer, Luz International, despite enjoying the benefit of generous tax breaks and a guaranteed and significantly higher-than-market price for the electricity it produced, went bankrupt shortly after completing the ninth plant in the complex. Commercializing a new electrical generating technology (as CSP was in 1984) is extremely difficult for a private sector company that is under constant pressure to deliver short term profitability. I would argue that it is almost impossible. The need to provide a steam generator for CSP plants significantly increases the cost and complexity of the facility. For example, the 280 MW Solana CSP plant being built in Arizona will cost more than $1.4 billion, or about $5/watt compared to installed PV costs of $2-$3/watt. As with any solar power installation the actual amount of energy generated on average is much less then the peak/rated power so costs/watt are even greater. For example, the SEGS plant realizes a capacity factor of about 21% so that the capital cost/GW-Hour is several times that of an equivalent natural gas-fired plant or nuclear plant. Even so, the ability to generate power well past sunset and the less variable output as compared to PV make thermal CSP a very compelling technology. A group of scientists and politicians have even suggested that a network of CSP plants in North Africa could provide a significant portion of energy requirements for Europe . There are several companies that have tried or are trying to make non-thermal CSP work on a commercial scale. The first variation of this approach is to combine a parabolic mirror assembly with a Stirling engine which is able to convert heat directly into electricity. Although Stirling engines have been around for a very long time it is only recently that material science techniques have been able to create a compact Stirling engine that is reliable in a production environment and can be mass produced for a reasonable cost. Stirling Energy Systems (SES) developed a 25 KW unit and constructed a demonstration project consisting of 60 such units near Pheonix, Arizona. Unfortunately, despite hundreds of millions of dollars of private investment and technology support from Sandia National Laboratory, SES declared bankruptcy on September 30, 2011. Another company using Stirling engines and parabolic mirrors is Infinia Corporation. Their Powerdish units, smaller in size than the units manufactured by SES are designed using a less complicated architecture offering greater reliability and attractive manufacturing costs. A large deployment of these units is underway at the Tooele Army Depot in Utah. This 1.5 MW installation will provide a test bed for the technology, which has the potential to be widely deployed in many parts of the world. The major advantages of Stirling engine CSP are significantly greater efficiency than currently available PV units, ease of installation even on rough terrain, and flexibility in terms of size of the facility. These systems also require very little water to operate using only a small amount to clean the parabolic mirrors from time to time. This is an important advantage as CSP systems are typically installed in arid or desert areas. Another type of non-thermal CSP installation has been developed by an Australian company. Like the SES and Infinia Systems these products make use of parabolic mirrors and dual axis sun tracking to maximum the concentration of solar energy throughout the day. The Solar Systems units make use of high efficiency, triple junction photo-voltaic cells to generate electricity. These systems offer the same advantages in terms of ease of installation and flexible size as the Infinia Powerdish. Solar Systems also claims that it will be relatively easy and inexpensive to upgrade the small photo-voltaic cells as triple-junction technology improves. Do I really believe that non-thermal CSP units such as those produced by Infinia Corporation and Solar Systems can make a significant contribution when it comes to developing a sustainable energy future? To be honest I don’t know. But I believe that every promising technology needs to be supported and investigated fully in order to assess and ultimately deploy the optimal mix of generating assets. We cannot afford to have more companies such as Luz and Stirling Energy Systems go bankrupt while at the same time subsidizing mass deployment of PV and wind generation facilities which are notoriously unreliable. 18-Oct-2016 Update: The Australian company ceased operations in July, 2015. An archive of its web site can be found at the Wayback Machine. Another new entrant in this field has developed a dish technology using the principles of solar troughs. MegaWatt Solutions out of India simple pipes a working fluid to the focus of the parabolic dish to heat it to generate steam, hot air, or hot water – whatever is needed for an industrial process. No Stirling Engine, no triple-junction solar module. The perfect application of the KISS principle. Innovation comes in all shapes and sizes. Fortunes have been made (and sometimes lost) on devices as simple as a new type of vegetable chopper (“the Slap Chop”) or as complex as a self-balancing people mover (“the Segway”). But when it comes to really large engineering projects, true innovation requires a highly skilled workforce, years of research and development, and vast sums of money. And although it may be unpopular to say it I think in most cases these kinds of projects need government backing to be successful. In 1881, a private French company began construction of the Panama Canal. Armed with an experienced lead engineer that had successfully completed the Suez Canal in 1859 as well as strong financial backing, the project looked eminently feasible. However, the considerable engineering challenges were overshadowed by an inability to control tropical diseases, which decimated the workforce. Furthermore, the planned sea-level canal without locks proved impossible. In the end, after spending almost $300 million (almost $7 billion in today’s dollars) the canal project was abandoned. When work resumed on the canal project in 1904 it was funded by the U.S. Treasury and managed by a government commission. Realizing that something had to be done about safe-guarding the health of workers, extensive research into the spread of tropical diseases, in particular malaria, was undertaken and mosquitoes were identified as the carriers of the disease. As a result extensive measures were put in place to control the mosquito population before work could begin in earnest. After the resignations of two civilian chief engineers President Roosevelt appointed an Army colonel to oversee the project after which it was run, quite literally, with military precision. In 1914 the canal was completed ahead of schedule and under budget having cost $375 million (approximately $8.6 billion in today’s dollars). In less than 8 years a multitude of technical challenges had been overcome despite significant setbacks including the loss of the Apollo 1 crew in a flash fire. On July 20, 1969 the lunar module of Apollo 11 landed in the Sea of Tranquility. A recent NASA review of the Apollo program estimated the total cost at $170 billion in 2005 dollars. In 1993 independent U.S., Russian, and European initiatives designed to create a permanently inhabited Space Station were combined into a single multi-national effort. With the addition of Canada and Japan the 5 partners in the consortium designed, constructed and built a number of interlocking components that were launched into low earth orbit starting in 1998. The International Space Station now consists of dozens of modules and has been continuously inhabited for more than 12 years. Total program cost; approximately $150 billion so far. I site these examples because they were all enormously challenging civil engineering projects that faced innumerable problems, some with no known solution at the time the project began. In each case the ultimate goal was clear although the path to success was anything but clear. No cost/benefit analysis was run, no shareholders were engaged to provide capital, and no projected payout period was defined. Only the collective resources of a nation or a consortium of nations were sufficient to enable these projects to achieve their goals. I believe that the time has come for another such effort, this one aimed at overcoming the greatest single obstacle blocking the path to a sustainable energy future. If you read my Christmas blog you already know what I am referring to. Given the fact that solar energy is not available after sunset and wind is controlled by unpredictable weather patterns there exists the statistical certainty that on some dark winter night an unusually strong ridge of high pressure will result in virtually no wind over the entire Midwest of the U.S. If we have developed wind energy to the point where it constitutes a significant percentage of total electrical generation this situation would be disastrous. The huge load imbalance would likely overwhelm the regional transmission grids causing a massive blackout at the most inopportune moment. There are only two ways to mitigate the impacts of this inevitable “perfect calm”. The first is to maintain all existing thermal assets (coal-fired and natural gas-fired plants) in a standby mode as “spinning reserves”. This would be environmentally irresponsible and financially untenable in the long run. The second and only reasonable solution is utility-scale energy storage. There are a number of existing or proposed energy storage solutions being discussed today. Hydro-pumping is probably the most widely deployed but there are very few geographic locations where this technique works. There can also be serious downstream environment consequences associated with hydro-pumping. Batteries would seem to be an attractive alternative storage mechanism until you realize the scale of the problem. In a research proposal referred to in one of my earlier blogs a warehouse containing 60,000 mattress-sized post-consumer and factory-reject electric car batteries would be able to store the electricity generated at night by one small wind farm. In another example, the world’s largest battery complex installed in Fairbanks, Alaska consists of 13,760 Ni-Cad cells. It is able to provide 27 MW of grid power for a grand total of 15 minutes and cost $35 million to build. The only true utility scale storage in use today consists of molten salt Thermal Energy Storage (TES) facilities at Concentrated Solar Power plants. The largest of these, the Andasol plants in Spain, have sufficient storage to produce 150 MW for up to 7.5 hours. The Solana plant under construction in Arizona will be able to provide over 250 MW of power for up to 8 hours. One or more of these technologies, or possibly another technology altogether, will surely be able to provide the energy storage required to make renewable energy sources reliable enough to provide 7×24 base load electricity. But to develop these technologies, even to build small demonstration plants, costs 10’s of millions of dollars. Fully optimizing, commercializing, and deploying these technologies en masse will cost billions of dollars. This is not the kind of research and development that can be undertaken by the private sector. In a recent blog posting noted venture capitalist and entrepreneur Richard Stuebi argues that the development of Black Swan Energy technologies will not take place without significant and sustained support from the public sector. In particular he challenges the concept that venture capitalists have enough risk appetite to fund and develop truly radical energy sources and technologies. Apart from financial and logistical support, governments also need to introduce regulations that provide special status for energy storage solutions with respect to transmission grids. In many cases grid operators treat energy storage as a consumer and charge grid access tolls that can destroy the economics of an energy storage solution. Grid operators need to acknowledge the vital importance of energy storage in a world where renewables become the dominant source of electricity. There should be no access tolls on energy storage solutions and I would argue that there should be Feed-In-Tariffs (FITs) for energy supplied to grids from storage facilities. Utility-scale energy storage is not impossible. Moreover, without it there really is no path forward to a sustainable energy future. But it will take an international consortium and a “failure is not an option” attitude to develop and implement the various technologies needed. Looking back on the energy news from 2012 there are a couple of over-riding trends. On a positive note, with significant taxpayer and/or ratepayer financial support through direct subsidies and Feed-In-Tariffs (FITs) renewable electrical generation is starting to have a major impact in several jurisdictions. On May 25 Germany set a new record for solar energy with production of 22 GW, providing approximately 50% of electrical demand for a few hours on that day. On September 14 Germany’s Solar and Wind Generating facilities combined produced 31 GW of power for several hours, again approaching or exceeding 50% of demand. In Hawaii, aggressive FIT support for residential and commercial photo-voltaic (PV) installations has resulted in some areas producing more than 10% of electrical demand for some hours during the day. Clearly, renewables are proving that they can be the foundation for a sustainable energy future. However, as the penetration of renewables has increased so have the problems. In Germany, the same policies designed to support the growth of renewables have resulted in electrical rates twice that in France, where the majority of electrical energy is produced by nuclear plants. The preferential treatment of renewables entering the German grid is actually causing higher utilization rates for coal-fired plants in preference to cleaner, more efficient natural-gas fired plants because the coal-fired plants are cheaper to run . At the same time the variability of wind and solar is stressing the German grid to the point where the reliability of grid power is now being questioned (the complex problems facing the industry were described in depth in a der Spiegel article in August, 2012). In Hawaii, the grid is experiencing significant stress due to the rapid installation of PV and on some circuits PV is nearing the 15% cap established by the local regulators . The financial impact of renewables is complicated and multi-faceted. Various subsidies and grants as well as FITs are problematic when most governments are running deficits. In many jurisdictions the taxpayer and ratepayer financial support mechanisms are designed to be decreased as the renewable industry “matures”. However, it is clear from the reaction of solar installation companies in Europe and Wind Energy developers in the US (who are facing the elimination of a significant FIT at the end of 2012) that a reduction in financial support will result in a dramatic decrease in activity and consequently significant job losses. Renewables can thrive but not without taxpayer/ratepayer financial support. In my opinion the financial support issue is not a serious problem. The cost of renewables is coming down quite rapidly. For example, the cost of installed PV has dropped by 50% in the past ten years. Wind turbine costs have been more erratic but the long term trend is down as well. Finally, any realistic assessment of the negative impacts of consuming non-renewable resources to generate electricity should result in a willingness to pay some short-term financial penalty in order to achieve a truly sustainable energy environment in the long term. Dispatchability: Wind and solar energy output cannot be controlled and therefore cannot be matched to consumption patterns. Conventional solar output decreases rapidly in the late afternoon at exactly the time that electrical demand is starting to peak. The intensity and duration of solar radiation also varies with the time of year and the amount of cloud cover. Despite these challenges solar power can to a large extent be predicted which makes it possible to plan the engagement of other generation assets to provide capacity as the solar output fades. The situation with wind is much worse. Large scale weather patterns can result in maximum wind energy output when it is not needed (for example, in the middle of the night) and zero energy output when electrical demand peaks. The inability to “dispatch” solar and wind energy when it is needed requires that essentially all existing thermal generation assets (coal-fired and natural-gas fired plants) be kept in some sort of standby state as “spinning reserves”. As a result, although the introduction of renewables significantly reduces the overall consumption of hydro-carbon resources and consequently the production of CO2, it does not allow for the decommissioning of thermal generation assets. In fact, by marginalizing thermal assets that are designed to provide 7×24 base load generation, the efficiency of these plants is compromised resulting in proportionately more CO2 production/MW-Hour as well as a significant degradation in the economic performance of these assets. The introduction of “smart grids” will provide some relief but will take many years to fully implement. The real solution is utility scale energy storage, which will be the focus of my first blog in 2013. Variability: When solar and wind generation assets are providing electrical power to the grid there are numerous rapid changes in the amount of power being generated. Unlike thermal assets, where steam generators act to filter out any short-duration changes in the amount of fuel being burned, renewables respond almost immediately to changes in environmental conditions. A large cloud moving over a photo-voltaic array can reduce output by as much as 60% in a few minutes. Similarly, the passage of a weather front can cause a wind farm to go from maximum to zero output in a matter of minutes. These types of very rapid, short-term variations pose a different kind of challenge to grid operators. Thermal assets cannot be ramped up or down quickly enough to deal with these variations effectively. A combination of smart grids, on-demand storage, and responsive demand will be required to address the variability of renewables. All of these technologies will require years of further research & development and optimization before they can be deployed effectively. In summary, during 2012 the problems associated with large-scale implementation of renewables have been exposed. There is a significant danger that 2013 will be the year that these problems reach crisis proportions. If there are significant disruptions to electricity supplies, up to and including extended blackouts, in either Germany or Hawaii the global impacts on the renewables industry would be enormous. Governments would immediately review commitments to renewables, financial support through subsidies and FITs would almost certainly be curtailed, and the renewables industry would face a very sudden drop in activity. The financial losses that would result would have a chilling effect on investments in renewables. The result could well be a fairly dramatic turn away from renewables for an extended period of time. A coordinated, multi-national effort is required starting right now to address the dual issues of dispatchability and variability that are associated with renewable energy resources. If we don’t work together to address these issues we risk losing a lot of the momentum that has been building over the past decade and our aspirations for a sustainable energy future will be put on hold for years to come.